When talking about Chile, several memorable icons come to people's mind, such as the first free trade agreement that China signed with a Latin American country, the wine, Patagonia and monumental statues. But they may also think of a person named Luis Schmidt Montes (Schmidt), who previously served as Chilean Ambassador to China from 2010 to 2014 and has been reappointed by Chilean President Sebastián Piñera to the position to continue his duty to bring the two countries closer. To many, he is an icon in bilateral ties. His wife, Patricia Gabler, jokes that Schmidt, having visited China countless times as a tourist and on business, probably were a Chinese in his previous life, because he likes the country so much and has witnessed its transformation over the years. The Global Times (GT) talks with Schmidt, who shares his thoughts on bilateral exchanges. 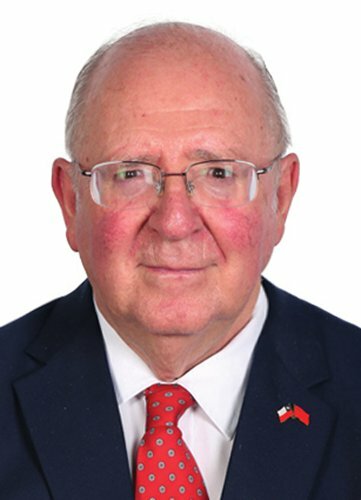 GT: You were the head of the Federation of Fruit Producers of Chile (Fedefruta) in 2016 until you were reposted as the Ambassador to China in 2018. You are also called an agronomist by many, with over 50 years of knowledge and experience in agricultural business. How do you transfer this experience to your work as the Ambassador to China? Schmidt: Let me begin by clarifying that I am not an agronomist. I am a civil engineer. However, it is true that I have been involved in the agribusiness sector for many years as an exporter of agricultural products and a leader of some of Chile's most important trade associations, such as the National Society of Agriculture (SNA) and Fedefruta. My experience in these fields has been very useful for my job as the Ambassador of Chile. Together with the public sector, the leaders of trade associations play a very important role in the opening of new markets for our country's products. They do very important work in the negotiation of trade agreements and the promotion of Chilean products and the Chilean image abroad. As an Ambassador of Chile, I have been able to meet and work with many people and leaders from the public and private sectors, not only in Chile, but also in other countries, especially in China. This personal and professional network is tremendously important for my job as an ambassador. Finally, my experience has allowed me to better understand how the public sector and the private sector can work side by side for the benefit of our country, which is the final goal. GT: Chinese people nowadays care about food quality more than ever before. More and more people are recognizing agricultural products from Latin America, such as quinoa and blueberries from Peru and avocados from Mexico. What are the iconic food products from Chile that are available in the Chinese market? Schmidt: Chile is the largest fresh fruit exporter in the southern hemisphere. We export a wide variety of high-quality agricultural products. You just mentioned blueberries and avocados. Well, maybe you don't know, but Chile is the largest exporter of blueberries and avocados to China. We are also the largest exporter of cherries and nectarines to China. The cherries from Chile are very famous in China because of their quality, beautiful shape and colors, which make them a perfect gift for the Chinese New Year. Chilean wine is also world class and it is very reasonably priced, so it is very well appreciated by Chinese customers. Now we are the third largest exporter of wine to China and the exporting amount is still increasing. Other Chilean exports such as pork meat and salmon are also increasing every year. And we are working hard to open the Chinese market for more healthy products from Chile. GT: Like Chile, China is a country in which agriculture accounts for a significant proportion of GDP growth. How do you think the two countries can work together in the sustainability of agriculture? Schmidt: Chile has exceptional geographic and weather conditions for agriculture. These factors, together with our experience and appropriate public policies, make us an agricultural powerhouse. The importance of the agriculture sector in our economy is growing every year and will keep growing because the world's demand for agricultural products is growing. Consequently, we must develop our agriculture in a rational and smart way to be sure that it will be sustainable. We need to be more efficient, more adaptable and more innovative. We also need to work on the development of new technologies for the agriculture industry. I believe that China would be an excellent partner for Chile to find these kinds of solutions. GT: During your previous term as the Chilean Ambassador to China, you made lots of efforts to boost bilateral trade and investment, especially in food and agriculture. What would be your priorities for the new term? Schmidt: The president, Sebastián Piñera, entrusted me with many ambitious tasks. We are working to open the Chinese market to new Chilean products, such as citrus fruits, oranges, lemons, mandarins, frozen fruits, hazelnuts, and alfalfa. We are also working to increase the volume of Chinese investments in Chile, which have been experiencing a turning point in sectors such as banking, renewable energies, mining, infrastructure and telecommunications. We think that there are lots of opportunities in the electromobility sector. We are also promoting Chile as a hub in Latin America for Chinese companies from sectors such as e-commerce, venture capital and start-ups. We want to deepen our relations in the scientific field, especially in Antarctic research and astronomy. We are working with China on a project for the construction of an astronomical observatory. We have also been working with China on a project to connect both countries through a submarine fiber optic cable. We also want to strengthen our presence in China, especially in the inland regions, because we already have done good work in the provinces along the coast. In the cultural field, we are working on a strong agenda for the year 2020, because of the commemoration of 50 years of uninterrupted diplomatic relations between Chile and China. We are also working on a film co-production agreement. GT: Mexico and Peru have been doing a lot to promote tourism in China, while Chile's efforts in this sector are comparatively less. What are the reasons behind this? Schmidt: During the last few years, Chile has been taking first place in the rankings of the most respected international media, such as Lonely Planet and National Geographic. I really think that in Chile you will find the most impressive landscapes on earth. The Atacama Desert, Patagonia, Antarctica, Easter Island, the ski centers in the Andes Mountains, the beaches along the coast, the vineyards in the central valley, the volcanoes and the lakes in the south and more. However, I certainly think that we should do more to make these places in Chile better known to more Chinese people, and this is one of our challenges also.